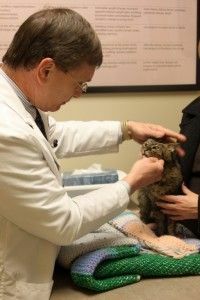 Regular exams allow Dr. Lange and Dr. Little evaluate your pet’s general health. They will look for problems, before they become serious illnesses. Since your pet cannot vocalize its feelings, you must rely on regular physical examinations by your veterinarian and your at-home observations to assess your pet’s health. In order to get more information your doctor may also wish to perform diagnostic tests, including blood tests and/or x-rays, to evaluate your pet’s health. These test will give more detailed information so your doctor can give you a more exact diagnosis.